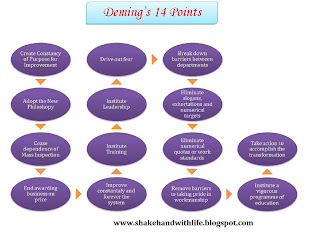 Create constancy of purpose for Improvement of product and service : Dr. Deming suggests a radical new definition of a company's role: A better way to make money is to stay in business and provide jobs through innovation, research, constant improvement and maintenance. Adopt the new philosophy : For the new economic age , management need to take leadership for change into a "learning organization." Furthermore we need a new belief in which mistakes and negativism are unacceptable. Cease dependence on mass inspection : Eliminate the need for mass inspection by building quality into the product. End awarding business on price : Instead, aim at minimum total cost and move towards single suppliers. Improve constantly and forever the system of production and service : Improvement is not a one-time effort. Management is obligated to continually look for ways to reduce waste and improve quality. Institute Training : Too often , workers have learned their job from other workers who have never been trained properly. They are forced to follow unintelligible instructions. They can't do their jobs well because no one tells them how to do so? Institute Leadership : The job of a supervisor is neither to tell people what to do nor to punish them, but to lead. Leading consists of helping people to do a better job and to learn by objective methods. Drive out fear : Many employees are afraid to ask questions or to take a position, even when they do not understand what their job is or what is right or wrong. They will continue to do things with wrong way , or not do them at all. The economic losses from fear are appalling. To assure better quality and productivity, it is necessary that people feel secure. "The only stupid question is the one that is not asked." Break down barriers between departments : Often a company's departments or units are competing with each other or have goals that conflict. They do not work as a team, therefore they cannot solve or foresee problems. Even worse , one department's goal may cause trouble for another. Eliminate slogans, exhortations and numerical targets for the workforce : These never help anybody do a good job. Let workers formulate their own slogans. Then they will be committed to the contents. Eliminate numerical quotas or work standards : Quotas take into account only numbers, not quality or methods. They are usually a guarantee of inefficiency and high cost. A person , in order to hold a job, will try to meet a quota at any cost, including doing damage to his company. Remove barriers to taking pride in workmanship : People are eager to do a good job and distressed when they cannot. Too often, misguided supervisors, faulty equipment and defective materials stand in the way of good performance. These barriers must be removed. Institute a vigorous programme of education : Both management and the work force will have to be educated in the new knowledge and understanding, including teamwork and statistical techniques. Take action to accomplish the transformation : It will require a special top management team with a plan of action to carry out the quality mission. Workers cannot do it on their own, nor can managers. 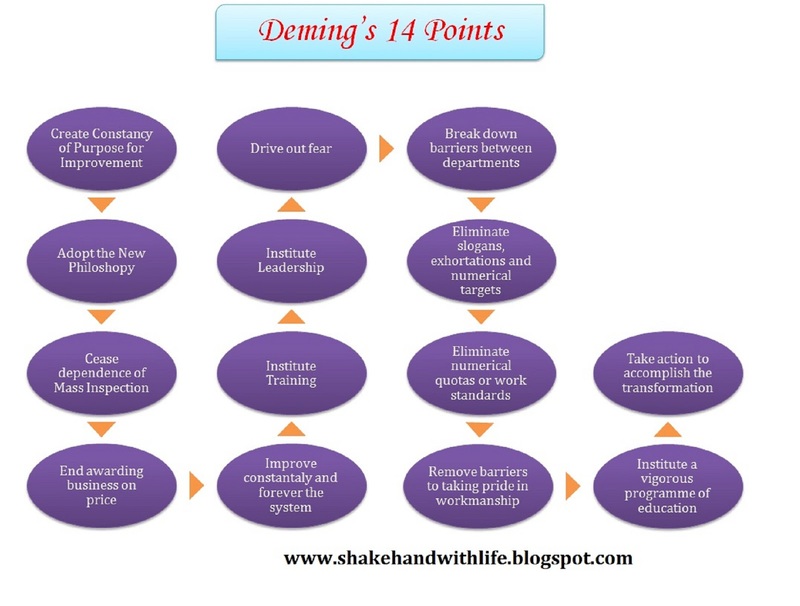 A critical mass of people in the company must understand the 14 points.